It may be a one-trick pony, but the Theremin's is a great trick and this is one hell of a pony. Classic Theremin sound. Addictively playable. Quality build. Not exactly versatile. If you just want the sound, you can get it from a plug-in. Invented by one Lev Sergeivich Termen, or Leon Theremin outside Russia, the Theremin has been around since 1919. Post WWII, mass production of the instrument was championed by the young Robert Moog, who started to sell it in kit form in 1953. The distinct character of the instrument has since become synonymous with '50s sci-fi movies, graced many classic recordings and continues to be a captivating musical voice through the virtuoso skills of players such as Lydia Kavina and Pamelia Kurstin. For those unfamiliar with the Theremin, it's a single oscillator instrument which uses two (detachable) metal rod antennas to control pitch and amplitude. The left antenna (a horizontal hoop) reduces the amplitude as the left hand is moved closer to it, while the right antenna (a vertical pole) increases the pitch as the right hand is moved towards it. Timbre and responsiveness are controlled via four knobs mounted on the front. The Volume knob sets the maximum output amplitude while the Pitch knob sets the lowest oscillator frequency. The Waveform knob controls the relative strength of harmonics in a similar fashion to the rectangular width control found on many synths. The Brightness knob controls the harmonic distortion applied to the signal, ranging the timbre from soft to aggressively bright, though without sounding harsh. 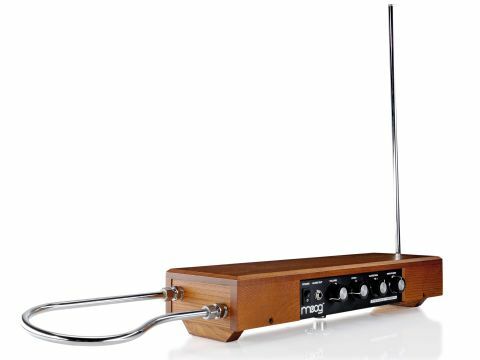 The Etherwave Theremin carries the classic Moog look - from the knobs to the ash wood boxing. The construction is of a high quality, with a robust mic stand mounting socket on the base and sturdy nuts/screw-threads for the antennas. The DIN power socket at the rear is safely recessed into the wood panelling. The audio output is front-mounted which is fine, though we'd prefer it at the rear to keep the cable free from roaming feet. The output is via a 1/4-inch phone jack which, with a 2.4 kOhm impedance, is best suited to high impedance instrument amplifier/DI inputs. If you've never used a Theremin before, it quickly becomes apparent how hard it is to play melodically, only enhancing respect for the real virtuosos. Despite this, the Etherwave possesses the classic Theremin sound and is instantly absorbing and playable. With practice, pitch coherency becomes possible quite quickly, and to this end a tutorial DVD is supplied in the box. The range of tones and expressions available is totally captivating, with vibratos and tremolos possible through the tiniest hand movements. The Waveform and Brightness controls really unlock the timbre of the instrument and, like many purely electronic instruments, the Theremin can take a huge amount of processing. The purity of the single oscillator (well, two oscillators in a subtractive configuration) prevents it from breaking up under the sonic stress of external effects and just routing it through a tape echo takes you straight into the 1950s Sci-Fi realm, à la Forbidden Planet. In the world of Theremins, the Moog Etherwave is a classic and a standard. There are plenty of other versions available, many in kit form, and often at a lower price, but the build, look and sound of the Etherwave makes it the best there is. The self-assembly version is £50 cheaper and is very easy to construct. Considering the niche, the price is fair. It may only do the one sound, but even if you don't record or perform with it regularly, it is an absorbing and strangely hypnotic pleasure, like a cross between Tai-Chi and cello playing. We've used plug-in versions and programmed synths to behave like a Theremin, but nothing has come close to the experience of playing this.